When the manuscript was acquired in 1908 it was in a one volume binding of brown morocco by Belz-Niedrée (Jean-Philippe Belz). In 1922 the manuscript was rebound into two volumes, separating pictures and commentary, by Marguerite Duprez Lahey: Volume I in full niger, Volume II in three-quarters niger morocco, in red morocco slipcase. Vicomte Blin de Bourdon (in his possession ca. 1901 when it was examined by Delisle and Meyer); purchased by J. Pierpont Morgan (1837-1913) from Brauer in May 1908; J.P. Morgan (1867-1943). 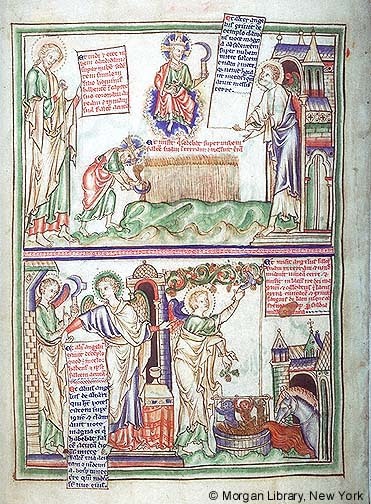 Ms. apocalypse picture book and commentary in two volumes; v. I, the picture volume, was written and illuminated in London, England, probably at Westminster Abbey, ca. 1255-1260; v. II, the commentary volume, was written ca. 1400, by a North French author, perhaps in France. M.524 was originally created as a picture book, as represented by Volume I. Around 1400 the unique text in Volume II was written specifically as an accompaniment to the illustrations. The language indicates a North-French author writing for a lay audience. In addition to moralizing commentary, the author includes criticisms of worldly prelates and jurists, and various references to contemporaneous events allow the commentary to be dated to the end of the 14th-beginning of the 15th century. Some time later the illustrations were interleaved and bound with the text, placed as close as possible to the text that described them, and a late 15th or early 16th-century hand foliated the newly bound book in Roman numerals at the upper right-hand margin of the rectos. The manuscript was still in one volume in 1901 when in the possession of the Vicomte Blin de Bourdon and studied by Delisle and Mayer.